Divisional Stores Depot at Bangalore is situated near Binny Mill area, 1.5 Kms distance from Bangalore city Railway Station. 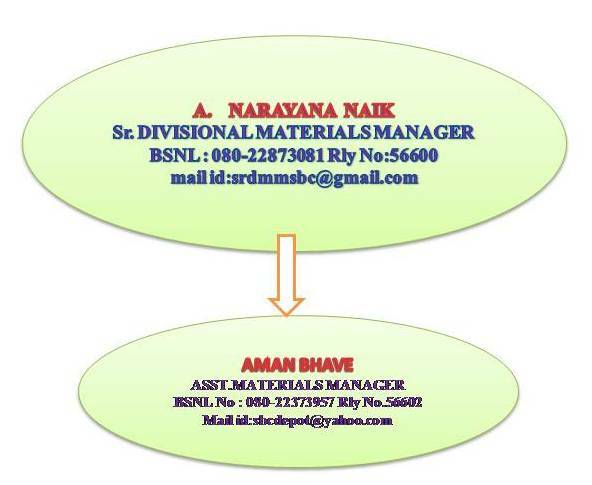 It was started in March 1999 as a sub depot to cater to the needs of Bangalore Division, and depot was developed to function as full fledged depot from October 2007 with the post of AMM working under administrative control of Sr DMM/SBC. At present, Main operation of this depot is to cater the large needs of all the consignees of Bangalore Dvn. Depot local purchase has been digitalized to IREPS since October 2014 and transaction works has been digitalized to IMMS since Jan 2017. The depot has started stocking mechanical and Electrical items for LHB coaches since 2012. Already near about 200 headings have been opened and about 289 headings are under the process of opening. SwatchBharat Abhiyan: Depot has voluntarily taken up the activity of cleaning the depot premises once in a week on every Saturdays. Recently, some show plants/flower plants have been planted in the open space in front of office for good ambience. During summer, staff are voluntarily keeping drinking water in earthen bowls for birds. Training on operation of fire extinguishers and steps to put off the fire was given to staff through demonstration on 16-12-2016. *This includes Lenin items required for AC coaches worth 9 crores for which separate ward with proper storage cabins is required. Proposal for construction of 1 godown for 74 lakhs has been sanctioned by GM/SWR with funds allotted by CAO/CN/BNC. Tender has been awarded and Earthwork has started. Further, depot require two more additional godown to accommodate new headings.